There are few things that say breakfast to me like scrambled eggs. They have been a favorite of mine since I was little. I especially remember mornings at my Grandma Greenhalgh’s waking up in the morning to the aroma of eggs and sausage. That’s part of the glory of food. It creates lasting memories and reminds us of people we love who may or may not still be with us. Grandma always had a way of scrambling them just right and loading them with plenty of gloriously delicious cheese. Yields enough to last one guy roughly a week. Set a large frying pan on Medium heat and start browning the sausage. While the sausage is cooking, crack the eggs into a separate container and then whisk until all the yolks are broken and mixed in with the whites. Add and mix in the garlic powder, rosemary, and salt and pepper. Chop the red bell peppers into whatever size pieces you are most comfortable with. Chop the scallions. Once the sausage is sufficiently browned, drain it if you desire and then put back in the frying pan. I leave a little grease in to provide some extra non-stickiness for the pan. 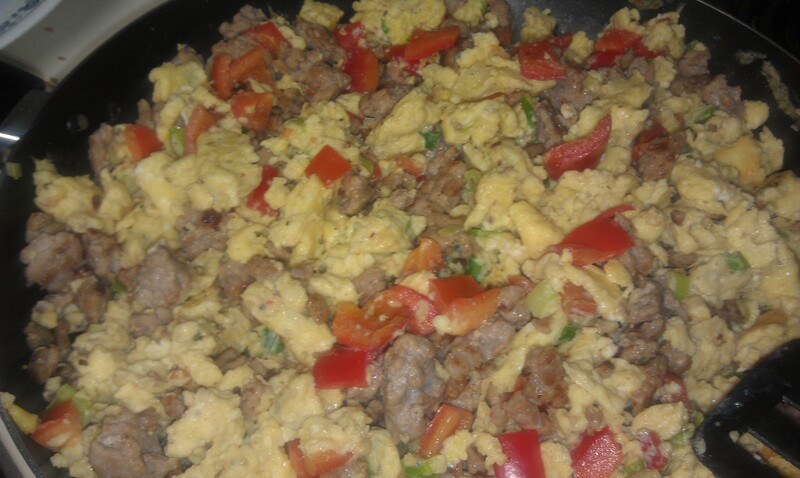 Pour the eggs over the sausage and add the sausage and green onions. Stir carefully as even a large frying pan may just barely accommodate everything. Continue scrambling the eggs until cooked through and serve. I love to garnish my eggs with medium cheddar cheese and pesto. Feel free to use whatever you like to put on your eggs just to give it that extra bit of yum! CrossFit – Day 3 – Running, Jumping, and Eggs!